Our list of the digital TV channels available on Freeview. Our list includes the Freeview channel name, channel type and the multiplex that the channel is broadcast on. The above lineup was obtained from a BT YouView set-top box, receiving signals from the Crystal Palace transmitter. The number or letter beside the channels in the above list represents the Multiplex (or MUX) that carries the channel. Freeview channels are broadcast on one of six dedicated Freeview multiplexes, and as channels are grouped in multiplexes, it’s common that you’ll either receive all of the channels on a multiplex, or none of the channels on that multiplex. Other Freeview problems or questions? See our Freeview FAQ section. Have suddenly lost many Freeview Channels, 7, 8, 10, 11, 12, 20, 21 etc., the ones in between are fine. Any suggestions please? Uninstall and reset.box up should do it . I tend to always do a complete channel retune (installation) via the menu button on the remote – seems to work each time. Got most of the HD channels, but not 107 to 113 – do I need to retune it again? Hi, I have the same problem no between channels from 105 and 120 also som missing in the 70s and high hundreds. I have given up trying. We live 4 miles from the transmitter but still can’t get Talking pictures on Freeview channel 81. I’m trying to send you a reply but I’m not sure if it’s posting. I have found that you have been trying to get Talking Pictures TV for more than a year, now, and would like the help you. I don’t know anything about the channel, but I assume it is of strong interest to you. Here is the reason why you are currently unable to watch it. You will not receive Talking Pictures TV from Wrexham transmitter, no matter what equipment you use or how much you rescan. As another poster mentioned, not all transmitter sites broadcast all channels. Some are government only ran sites giving main channel coverage to black-spot areas. Think of these transmitters as “repeaters.” They take the signal from the big main transmitters and rebroadcast them to smaller local areas, but without many commercial channels (including Talking Pictures TV). What does all this mean for you? Well, it means you now have two options for how to get Talking Pictures TV channel. 1. Moving your TV antenna. Those main transmitters with the full channel list may cover your home. There are two near Wrexham; Moel-Y-Parc (Wales) and Storeton (England). Without knowing where in Wrexham you live, it would be hard for me to guess which one might cover your home, but a TV antenna installation engineer would know and test this to get you the best signal for your TV viewing pleasure. For this reason, I would also not recommend moving the antenna yourself. 2. Using “Freesat” instead of “Freeview”. You might not get signal from those Freeview transmitters at all, in which case you would be back to square one. So what is Freesat and how is it different? Well, it’s basically the same thing, except it uses a satellite dish instead of a TV antenna. This way, you will surely get Talking Pictures TV. Another advantage? You can get many more channels you’re currently missing out on, maybe more than 100 extra channels. So instead of using a TV antenna, you need a satellite dish. Again, an installation engineer could do this (not Sky TV or any subscription stuff, don’t worry). If you previously had Sky TV or there was already a dish installed when you moved into your house, you might not need an installation at all. However, either way, you also probably need to change your equipment. This means buying any “Freesat” tuner and connecting this to your TV, or changing your TV for a “Freesat ready” TV if that is preferable to you (I know you bought a new Samsung TV). 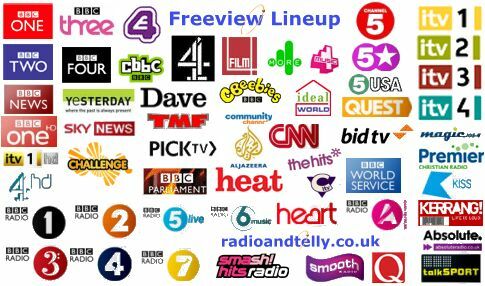 Check freesat.co.uk for everything you need to know. I hope this helped and please do keep us up to date on your progress. I bought a new tv for Xmas full HD and 4K. 47 inches. Still can’t get talking pictures. on Freeview. WRT Talking Pictures – Check your complete listing and go to the 800 series listing. I can’t remember which channel it is on but my mother wanted to see a film on the channel and, like you, got no reception on CH81. I checked the complete channel list and found in the 800 series. Thanks, i will have a look through. This site is almost dead now. No CNN but you have it at the centre of your advert ??? When can I expect to get Talking pictures on freeview in North Wales. I have just done a Re-tune and seem to have lost my favorite channels………….10/20/61/&70, why has this happened ???????? I still can’t get Talking pictures on my Freeview. Tried and tried retuning. I guess you are stressed because you will miss the repeat episode s and omnibus edition of eastenders. ^ No idea of what else happened there. I live in Wrexham North Wales, but still cannot get talking pictures on Freeview channel 81. I’ve just checked on my latest full rescan for you Ron, and I’m afraid to say it’s showing 81 for me, so I suggest if you can make any sense of my first post, give that a go perhaps. Thanks for your reply Ian, I really do want to crack this but can’t make head or tail with your post. Lots of adds and pluses. Can you simplify it for me to know what to ask for please. Sorry website did not like my (linkdashs) in a nut shell you must use a freeview HIGH DEFINITION tuner not just a standard freeview tuner. Thanks Ian. I will look into that in town tomorrow. I found a webpage with updated channel numbers for Freeview, Sky, BT and Virgin. http://britishtvchannels.com/uk-tv-channel-numbers.html It has only got the main channels but might be of some help. I can not tell if this is up-to-date but when the last time it was edited/looked at is shown as a year ago and the “Is our list out-of-date? Let us know” link doesn’t work, one can’t have too much faith in it. Anyone know a site that actually does give an up-to-date list ? When I looked at the nearest signal we are literally just 5 miles away from ours but I still can’t get Talking pictures on my Freeview. I got a HD tv to make sure but still can’t get it. Ron – Talking Pictures is on Channel 81 on FreeView. It’s great. It needs an HD receiver because it broadcasts on an HD multiplex. Maybe retune your TV to get all the latest channels. I have changed my tv to a HD Samsung but after retuning still can’t get channel 81 Talking pictures. On my channel 81 is the shopping channel. No it isn’t a smart tv. Hi Ron, just wondering what region you are in. There is an engineering site that says that the Dover region transmitter doesn’t carry COM7. TalkingPictures is on COM7. I still can’t get Talking pictures on my Freeview. I live in Wrexham, North Wales. Watched The Son on freeview BT for 2 weeks and now with no explanation its no longer on. Why would that be ??? I have a LG HD TV and have been trying to get Channel 81 Talking Movies. I have clicked on the Freeview availability link which tells me It should be available at my address. But despite retuning I am still unable to get it. Channel 81 shows but with a blank screen. i cannot get ch 81 talking pictures any ideas. I keep trying every week by retuning my Freeview tv but still can’t get Talking Pictures in Channel 81. All I get is shopping channel on that. New freeview recorder installed – but no channel 19 Yesterday. It is there on the TV tuner – but not of the recorder. Ron: Do you get your tv signals from a main transmitter (maybe Moel-y-Parc for Wrexham), or from a repeater transmitter?Repeaters don’t put out all multiplexes. Talking Pictures is on com7, so you could try some other com7 channels, eg 5USA1 on 83, or Transworld Radio on 733. If you can’t get those, I suspect your whole com7 multiplex is missing. I don’t know but I will try and find out. I highly recommend talking pictures channel. How can I get Fox News ( Sky has dropped it ) in the UK ? I replied to you. See up. Why can’t we get PBS America on Channel 94 here in Llandudno? I’ve tried re-tuning two TVs and a Freeview box – no good. Has Forces TV and PBS America been removed from the channels that are broadcast on Freeview ? we were instructed to retune for today – 21march – and they have disappeared from the list, nor do they appear on the Freeview website list !!! Viva has been closed for months, how often do you update your page???!!! Freeview Channel List needs updaing on this site. New channel Paramount Network on 57 and CBS Drama now on 71 but not after 11pm. And why are the comments going in reverse order, hate scrolling down especially when pages take time to load!! !